Mary BUCHANAN Carlisle, Ia Millie HAWORTH Ackworth, Ia. Loren MORGAN Ackworth, Ia. Belle HAWORTH Ackworth, Ia. Minnie SMITH Bartlet, Ohio Ella ELLIS Milo, Ia. Millie HAWORTH Ackworth, Ia Belle HAWORTH Ackworth, Ia. Mollie COSAND Western, Neb. Arthur BURGESS Medora, Ia. Chas. H. DAVIS Casey, Ia Martha POLSON Pleasantville, Ia. Anna HOAG Ackworth, Ia. Reuben FELLOWS Milo. Ia. G. E. BERTCH Carlisle, Ia. Minnie DAVIS Gypsum, Kan. Challie STANLEY Ackworth, Ia. Esther FRAZIER Ackworth, Ia. Luella BARLETT Ackworth, Ia. Ella ELLIS Milo, Ia. Alice STARBUCK Ackworth, Ia. Rachel FRAZIER Ackworth, Ia. Ellie HODSON Indianola. Ia. Charlie HODSON Ackworth, Ia. Chas. HODGE Sandyville, Ia Samira CRAVEN Plainville, Kan. George ELLIOT Berwick, Ia. Chas. VANTRESS Ackworth, Ia. Gideon FRAZIER Ackworth, Ia. Maud WILEY Ackworth, Ia. Chas. FLESHER Palmyra, Ia. Chas. BALES Ackworth, Ia. Dillon MORDOCK Palmyra, Ia. Melissa HIATT Ackworth, Ia. Ella VANFLEET Flaglers, Ia. Frank HAWORTH Ackworth, Ia. Fred HALL Palmyra, Ia. Almeda REYNOLDS Carlisle, Ia Wm. 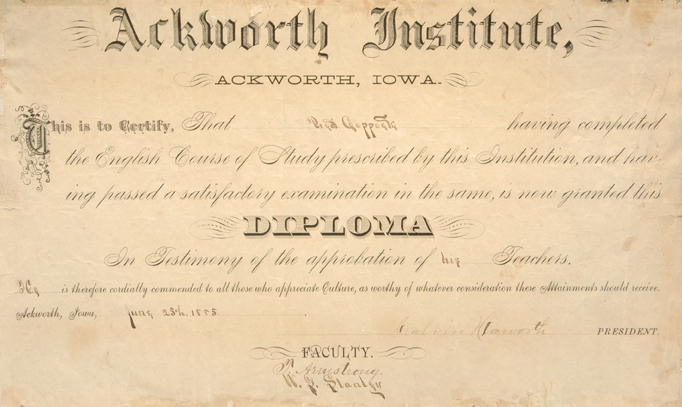 G. HAWORTH Ackworth, Ia. Wm. ADAMSON Palmyra, Ia. Fred BURGESS Medora, Ia. Frankie BURGESS Medora, Ia. Chas. PERRY Ackworth, Ia. Frank STARBUCK Ackworth, Ia Maud PITMAN Indianola, Ia. Jane BLAIR Des Moines, Ia. Rebecca BLAIR Des Moines, Ia. Geo. W. SELL Ackworth, Ia. Calvin VANTRESS Ackworth, Ia. Arthur MCELROY Milo, Ia. Clara BEEM Pleasantville, Ia. Sophia TIDBALL Ackworth, Ia. Sarah TIDBALL Ackworth, Ia. Ransom BEEM Pleasantville, Ia. Tillman BEEM Pleasantville, Ia. Ruth CRAVEN Plainville, Ian. C. SIMONS Ackworth, Ia. Alex. GINDER Ackworth, Ia. Aquilla MOON Ackworth, Ia Elmer GINDER Ackworth, Ia. Walter HUBBARD Sandyville, Ia. John HIATT Ackworth, Ia. Lizzie STANLEY Palmyra, Ia. John BALES Ackworth, Ia. Nettie GREGG Des Moines, Ia. Clifton STANLEY Ackworth, Ia. Willie CRAVEN Ackworth, Ia. Emma LEWIS Ackworth, Ia. Burton STANLEY Ackworth, Ia.